by Bill Dwight on Wednesday, June 30, 2010 at 8:28 AM | LEAVE A COMMENT! 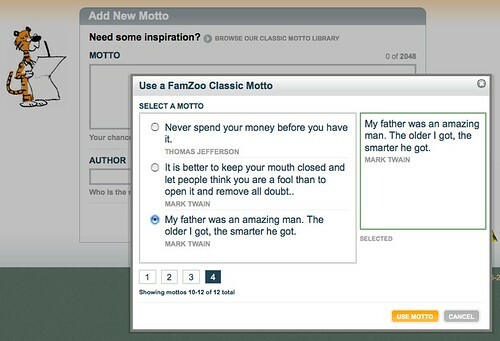 Did you know that you can add your own “family mottos” to FamZoo? 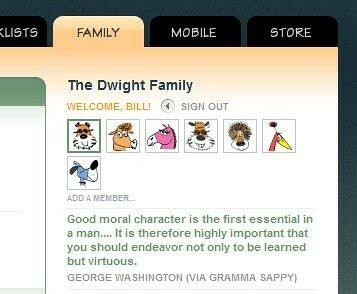 They’ll show up in the right hand sidebar just beneath your family’s avatars. Your mottos might be favorite family sayings or famous quotations that capture the essence of your family values, goals, spirit — whatever you like. 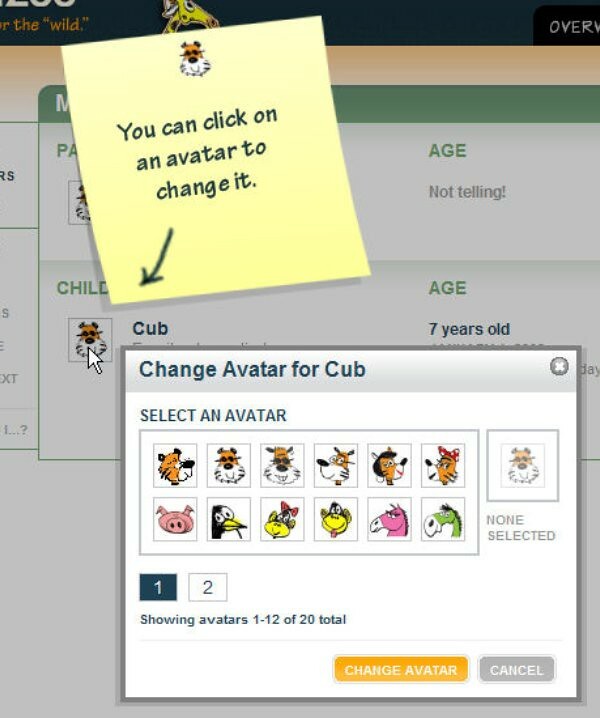 If you have more than one, they’ll rotate each time a family member visits a FamZoo page. Here’s a screenshot of a motto we’ve just added to our family. It's one of my mother-in-law’s favorite quotations. You can set your mottos up under the Family tab. Just look for the Mottos link in the Viewing section on the left hand sidebar. Clicking on the Mottos link brings you to the Mottos listing page. Click on the Add link in the Actions section to add a motto. This takes you to our Add Motto form where you can type one in directly or grab a “classic” from our Motto gallery. Back on the Mottos listing page, if you want to edit or delete an existing motto, just fly over it with the mouse and click on the desired action icon (pencil for edit or trash can for delete). What are some of your favorite family mottos? by Haley Dwight on Friday, June 25, 2010 at 5:28 PM | LEAVE A COMMENT! 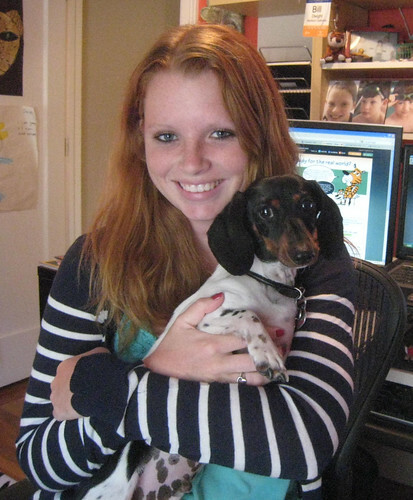 This is entry #3 in a weekly summer series by "guest blogger" and FamZoo summer intern Haley Dwight. 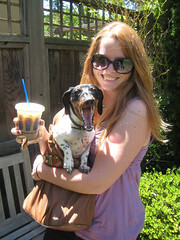 The picture this week is in honor of Take Your Dog to Work Day and it features Colby, our cow-colored piebald dachshund. I like how this article walks parents through financial lessons for kids of every age, from toddlers to teens. The article starts off with the top things to know about children and money, then goes into depth on allowances, saving and spending, credit, and investing. One message in the article I really like is: when it comes to teaching kids about money, the sooner the better. Kids are a lot more likely to listen to their parents when they don’t have the anti-parent attitude that seems to increase with age. If you teach them the value of saving early on, they’ll be less tempted to blow their money when they’re teenagers and more spending opportunities arise. For example, my eight-year-old brother puts any money he can find in his FamZoo account, including loose change he finds in the car or under the sofa. 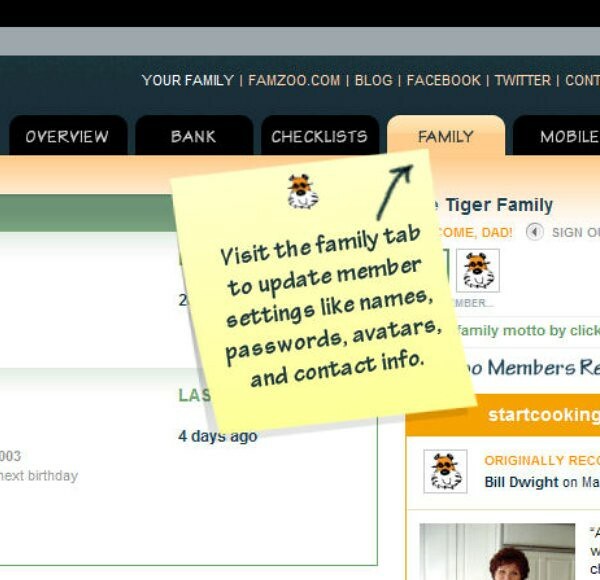 Too bad my Dad didn’t build FamZoo until I was in my “tween” years! Paul put together a great list of ways to teach your kids about money. He divides the tips into three categories: introducing kids to money, allowance and spending decisions, and buying smart. I especially like tip #13, which encourages parents to explain to their children how credit cards work. I’ve stumbled upon many articles recently that stress the importance of exposing children to paying with cash and not with credit, debit, or checks. While I understand that the visual nature of cash changing hands helps the child understand that the money is gone, we live in a world where the majority of transactions are made with cards or checks. It’s essential children are taught about non-cash methods of payment and how they work. In fact, there are some real benefits to credit cards if used responsibly. For example, my Dad (who is careful to always pay off his balance each month) uses his credit card rewards points to get free Starbucks all year long. As a Starbucks fanatic, that’s a benefit I can really appreciate! Growing up in Silicon Valley, I appreciate Vered’s article about raising children in a privileged, materialistic environment. While Silicon Valley is mainly a place of invention and success, the harsh reality is that there are a few people who focus primarily on the result of these inventions: money. The only thing worse than greedy adults are their greedy children running around clutching their iphones and parents’ credit cards. My parents have always provided me and my brothers with everything we need and more, but they have also stressed the importance of living within our means and managing our money. One of Vered’s suggestions, splitting the cost of larger items with your child, has worked well in our family. My 13-year-old brother decided he absolutely needed to have his own laptop, quite a large expense for such a youngster. My Dad agreed to pay half the cost of the most basic model. My brother took out a loan from “The Bank of Dad” to pay for the rest. His “half” ended up being quite a bit more than my Dad’s half as he decided he needed the high end model. Now, 75% of his weekly allowance is automatically diverted towards paying off the loan. He’s also decided to contribute any extra dollars (from birthday checks, extra chore money, etc.) so he can pay off his loan in under two years. You have more freedom and less arguing. 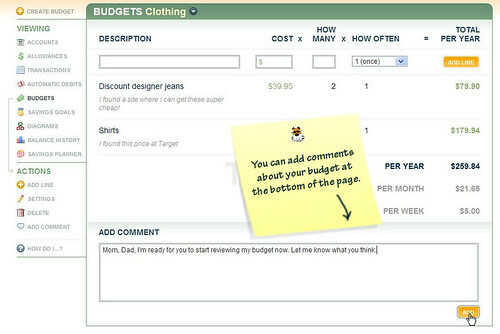 Do you find yourself squabbling with your parents over every little purchase you want to make? 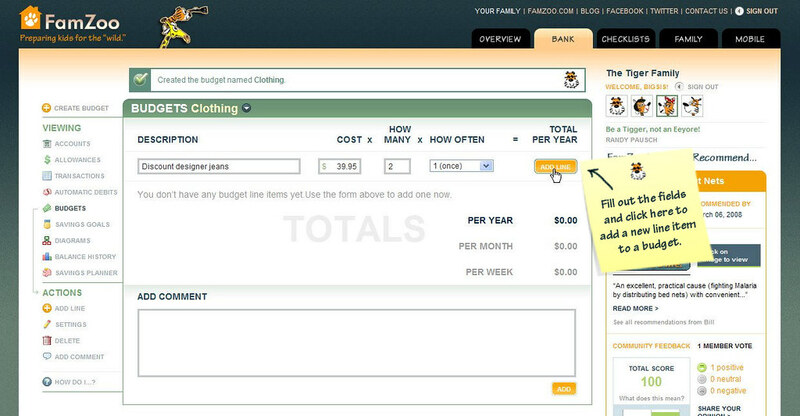 FamZoo puts you in charge of your own money. Once you and your parents agree on an allowance and some general rules about what’s OK to buy, you have the freedom to spend your money as you please — no more begging, no more nagging. You get your allowance on time, every time. Do your parents ever forget to give you your allowance? 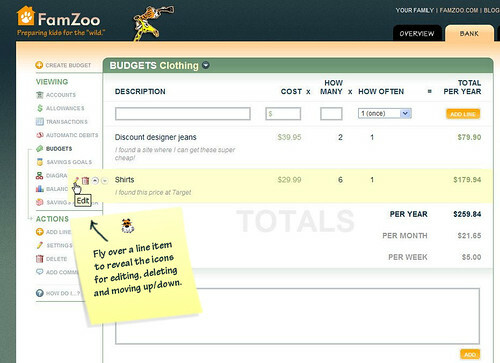 With FamZoo, allowance is automated, so your parents can just set things up once and never worry about it again! 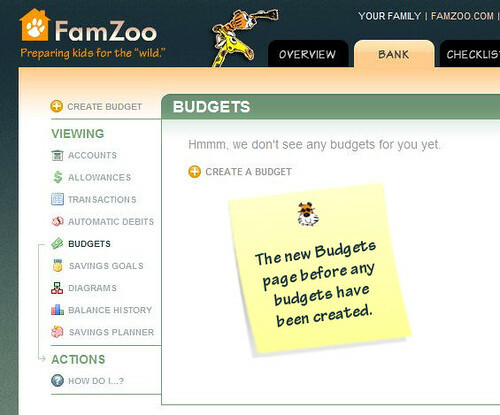 Every week (or month) FamZoo deposits your allowance into your account. You always know exactly how much money you have. Have you ever had something you really wanted to buy, but you weren’t sure how much money you really had or how long it would take to save for it? 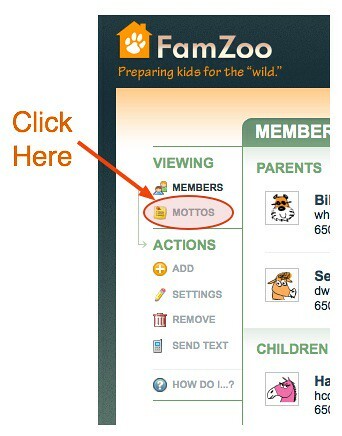 FamZoo makes it easy to see your exact balance at any time — just log into the site or send FamZoo a quick text message. 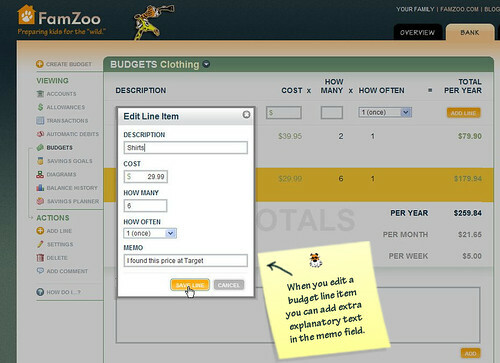 If you don’t have enough, you can use FamZoo’s easy savings planner to find out just how long it will take to save for that special purchase. Still have questions or concerns? Just leave me a comment below, and I’ll get back to you! by Bill Dwight on Tuesday, June 22, 2010 at 2:02 PM | LEAVE A COMMENT! Have you taught your child know how to make a budget and stick to it? Budgeting is a fundamental personal finance skill that every child should practice and master before graduating to the real world. I suggested a simple 3 step plan for teaching your child to budget in a recent guest post over at BetterParenting.com. Check out the new budgeting capability in FamZoo, and let us know what you think. by Haley Dwight on Friday, June 18, 2010 at 5:43 PM | LEAVE A COMMENT! This is entry #2 in a weekly summer series by "guest blogger" and FamZoo summer intern Haley Dwight. Pari has four suggestions for parents teaching their children to be financially responsible: be a role model, encourage your child to save, help your child develop a sense of financial empowerment, and show your child how to be philanthropic. I especially like the emphasis that Pari places on parents as role models and philanthropy. Both of my parents have been very active in my financial education (no surprise there with FamZoo!). They’ve also set a consistent example as far as giving back to the community. My Mom puts in tons of volunteer hours for all of the sports teams my four brothers and I have been on, and my Dad has worked with each of us on philanthropic projects. 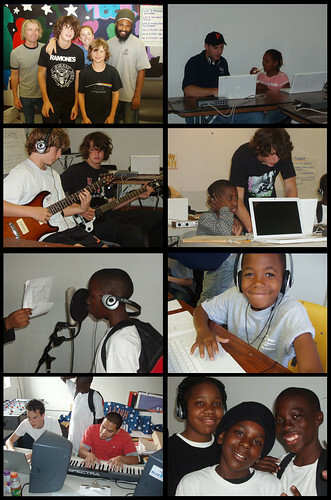 Here’s a picture of my Dad working with two of my brothers on a project to bring mobile recording studios to underprivileged kids in tough neighborhoods of San Francisco. Watching my Dad take time away from his busy work day to be involved with philanthropy motivates me to do the same. Ronnie, a script writer for the Frugality Game, gives five easy ways to teach your child about money management: set spending goals, give your child a clothing budget, lend your child money (making them pay it back as they would a loan), give an allowance for charitable giving, and discuss bills with your child. 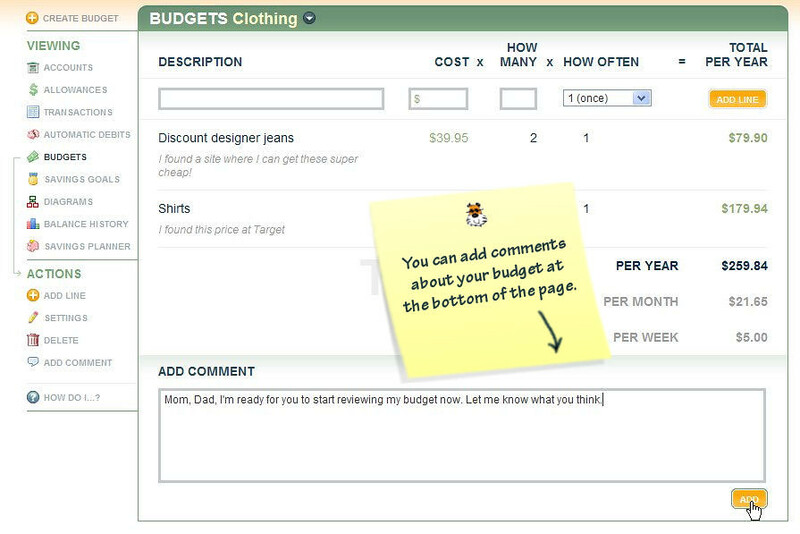 When reading this article, I related to one suggestion in particular — giving your child a clothing budget. I LOVE to shop. When I was in high school, my Dad and I sat down and worked out a clothing budget. He decided to give me an annual clothing allowance based on our budget. I was so excited when I got all that money up front. Foolishly, I spent nearly all of it within the first month on designer jeans and shirts that I wore only once. For the rest of the year, I couldn’t afford items I actually needed, such as sweaters for when winter rolled around. I have to admit that I’m still a bit impulsive about my spending on clothes, but I’m getting better with practice. Chores are one of the more common reasons children and parents argue. No kid wants to be bothered to make their bed or do the dishes when they could be going to the pool with friends or playing their favorite video game. James Lehman gives six ways to get children to do chores when asked: stop the show, time your child’s performance, tie chores to an allowance, use structure, don’t use chores as a punishment, and use a rewards system. With 5 kids in the house, my parents didn’t want the hassle of checking off chore charts every day. They deliver our allowance automatically each week in our FamZoo accounts. That said, my parents wanted to hold us accountable whenever we blew off our chores. So, they created a “Chore Fail Chart” that automatically hits the slacker kid’s account with a penalty when an item is checked off. That way, they only have to check off items when we’re naughty. The system seems to work for both parents (less hassle) and kids (less nagging). by Bill Dwight on Thursday, June 17, 2010 at 4:12 PM | LEAVE A COMMENT! FamZoo is featured on a new episode of the Daytime Emmy nominated public TV series Biz Kid$. 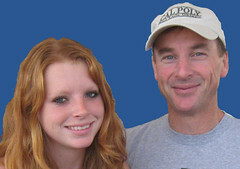 The two-and-a-half minute segment shows how "Chief Zoo-Keeper" Chris uses the FamZoo-powered “Bank of Beaufort” to teach his two teens — Taryn and Evan — personal finance skills. Check your local public TV listings for Biz Kid$ air times in your area. Look for the episode named "Where’s My Allowance?". Do your kids watch Biz Kid$? Tell us what they think of the show in the comments below. This article quickly covers the When, What, and How Much of introducing an allowance. On the How Much question, I particularly liked the advice: “the ideal allowance enables a child to buy some items but not others, thereby teaching selectivity and a basic form of budgeting”. This goes for a child of any age. For example, my 8-year-old brother can either spend his money now on a his favorite honey candy, or save for a few weeks to buy that set of Yu-Gi-Oh cards he’s been dying to have. Likewise, I can either spend money on a dinner with friends right now or save to buy those True Religion jean shorts I’ve been eyeing. Having a coveted item in mind makes saving worth passing up smaller opportunities along the way. Each of Alexa’s ways to teach kids about money is helpful and easy to do: making a game of saving money at the grocery store, using games and puzzles to teach basic money concepts, using allowance as a learning opportunity, turning charitable giving into a family routine, and discussing relevant articles around the dinner table. 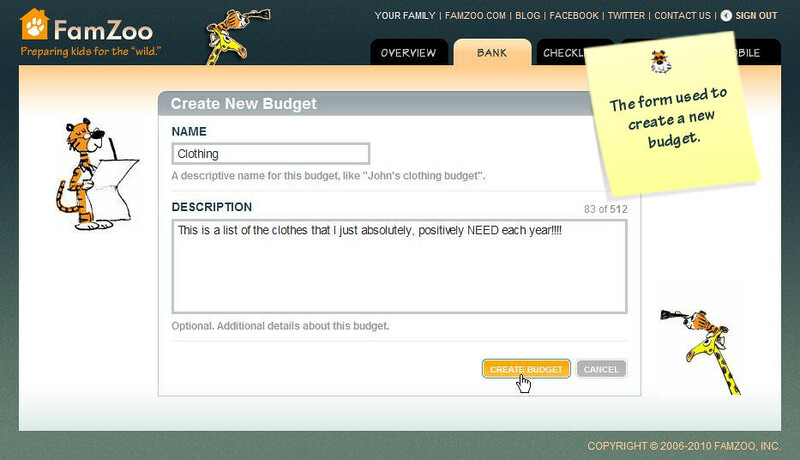 We’ve used FamZoo in our family as an online version of her three jars allowance suggestion — one each for spending, savings, and charity. We’ve also created a family tradition of writing letters to the troops each Thanksgiving. Melinda suggests 5 ways to teach your child how to handle and save money: shopping together, using a regular allowance, setting goals for larger purchases, letting your child learn firsthand from spending mistakes, and training your child to understand interest. I think learning from your own spending mistakes is particularly important. I’ll never forget the time I blew half my clothing budget on a wear-it-once prom dress. I couldn’t afford any new clothing for the rest of the year - oopsie! 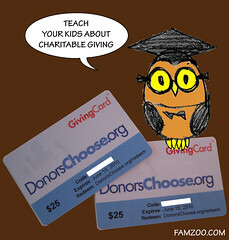 I've posted before about DonorsChoose.org and how it’s a wonderful site for introducing your kids to charitable giving. Well, I happen to have two $25 DonorsChoose giving cards that I'd be delighted to hand out. If interested, just leave a comment here or on our FamZoo Facebook page about any thoughts you might have related to kids and philanthropy. I’ll pick the two most interesting ones by 9pm Pacific Time tonight (6/2/2010). I'll send the winners the redemption codes by email (which you can send to us privately via our Contact Form). The cards expire June 15th, so you'll want to sit down with your child and select a project right away.